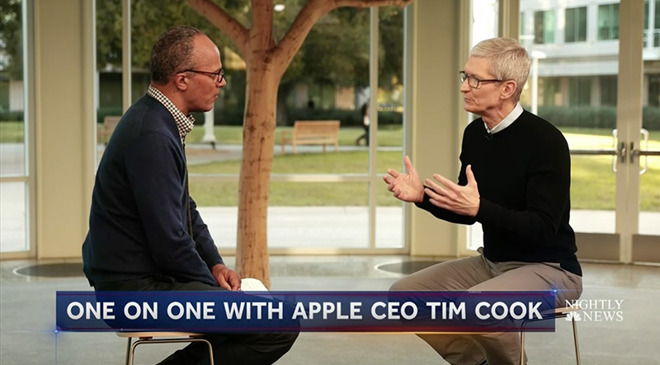 Apple CEO Tim Cook sat down with NBC News' Lester Holt on Wednesday to talk about issues affecting the modern tech industry landscape, from tax reform to concerns that Russia interfered with the 2016 presidential election through a wide-reaching social media campaign. Teased earlier today, Cook's interview with Holt will air on NBC's Nightly News, but clips of the short session have made their way online. A snipped published on Twitter had Cook commenting on a congressional investigation into Russia's potential interference in last year's election. Lawmakers are currently holding hearings in Washington, D.C., with executives from Facebook, Twitter and Google to determine the roles those companies played in Russian state-sponsored attempts to disrupt the democratic process. Social media tools are at the center of the inquiry. Platforms like Twitter and Facebook are perfect outlets to disseminate so-called "fake news" and other propaganda on a massive scale. Bipartisan subcommittees are attempting to suss out the how and why of Russia's operation to spread disinformation through various social networking platforms. For Cook, the issue is not about ads, as some have contested, but more about social networking tools themselves. "I don't believe the big issue are ads from foreign governments. I believe that's like .1 percent of the issue," Cook said. "The bigger issue is that some of these tools are used to divide people, to manipulate people, to get fake news to people in broad numbers to influence their thinking. This to me is the number one through ten issue." He added that the hearings will likely surface relevant details, but pointed out that the onus ultimately falls on companies and users. "We'll probably learn more in those hearings as to the particulars. But I do think that technology itself doesn't want to be good. It doesn't want to be anything," Cook said. "It's up to the creator of the technology and the user of the technology to make it good." Asked whether he thinks the tech industry has a bad reputation, especially in Washington, Cook said not all companies are the same. "Just like all New York companies aren't the same, and all media companies aren't the same, well all technology companies aren't the same either," Cook said. "They have different values, different principals, different values." Riffing off that point, Cook went on to point out, yet again, that Apple does not view its customers as a product. Unlike other companies that target users with ads, Apple takes a privacy-first approach to its products and services. That includes Face ID on iPhone X. "We have a chip in here where the image of your face is stored and encrypted," Cook said. "And so Apple doesn't have that, your device has that." Holst asked whether his visage is being stored in the cloud, to which Cook quickly replied, "No, no, no, no. We don't have it intentionally because it's yours, it's not ours." Tax reform is another topic of debate, with a much longer history than recent allegations involving the election. Apple has long been on the side of tax reform, and avoids high U.S. taxes by assigning revenue to international subsidiaries. The company keeps some 94 percent of its cash reserves overseas, a figure that as of last quarter amounted to $246 billion. Apple has in the past called for a "repatriation holiday" that would allow it to bring back some of that money without incurring exorbitant tax penalties. Cook in today's interview reiterated Apple's stance on U.S. taxes, saying, "this isn't good for the U.S. There's no tax receipts there. And it's not good for investment in the U.S. And so this needs to be fixed. In my view, it should have been fixed years ago. But let's get it done now." Finally, Cook briefly discussed iPhone's history and legacy. Holt asked whether Apple has accomplished what company co-founder Steve Jobs' envisioned of the product with iPhone X, a device that arrives ten years after the first version debuted in 2007. "We knew from the launch it was going to change the world, but frankly it's gone far beyond what we would have dreamed," Cook said.